He was born on 4 January 1930 in Hong Kong. Graduated in 1953 with Honours in Design from Melbourne University. As a Chairman, his responsibilities lie in the fundamental decision making in regard to policies on design, building quality and the deployment of key personnel for the various tasks. A constant review of the design quality of all jobs undertaken by the office is maintained. His directorship also carries the function of conducting vital interaction between the Singapore office and all the associated firms in London, Sydney, Vienna, Hong Kong, Kuala Lumpar and Penang. In 1957, he founded the firm and since then has worked closely with several ministerial departments, appointed by the Government of Singapore as a Member of the Commission of Enquiry into the Building Industry, sat on the Development Control Committee and was appointed by the Minister of Education as a representative on the Board of Governors for Singapore Polytechnic. From 1963 to 1965 he was the President of the Singapore Institute of Architects and retained a council member position until 1972 before becoming a member of the Institute’s Practise Committee. That same year his affiliation with the country’s leading university began with his position as the SIA representative on the Council of University of Singapore. Over the next decade, his numerous appointments included positions with the Energy Conservation Building Committee (set up by the Public Works Department), the Public Service Disciplinary Panel, the Ministry of the Architectural Design Panel, the Mass Rapid Transit Authority, and the URA Restoration and Development Panel for Raffles Hotel, Bugis Junction and Albert Court. His capacity as a human dynamo continues into the nineties. From 1990, he was appointed member of the Architectural Design Panel by the Minister for National Development, Director of Technology Parks Pte. Ltd., Committee member of Jurong Town Corporation Advisory on Research and Development, and Member of the CHIJ Supervisory Panel for the URA. His previous portfolio included a position on the Design and Aesthetics Advisory Group of Singapore’s Arts Centre, and he was President of the Rotary Club of Singapore for 1996/1997. 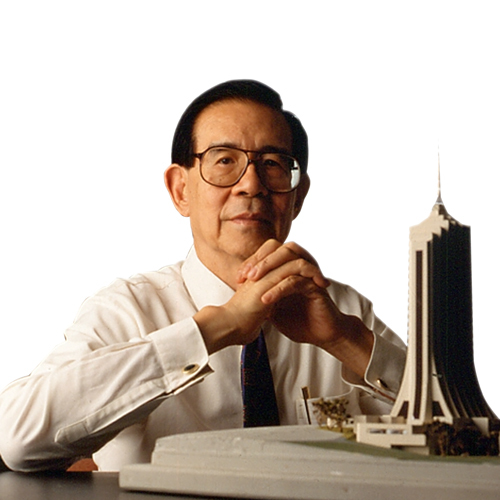 In 1998, he became the first recipient of the Singapore Institute of Architects Gold Medal, awarded for a lifetime contribution to Architecture. In 2005 the Government of Singapore as part of the National Day Honours, conferred the BBM (Public Service Star) on Mr. Wong for his contribution to Architecture.